Lets be honest, when you look at yourself first thing in the morning, are you thinking - wow I look really great right now? Chances are, probably not. Most of us do not have perfectly even skin tone. This is where Laura Mercier comes in. Being in my twenties, I am not compelled to use foundation yet. 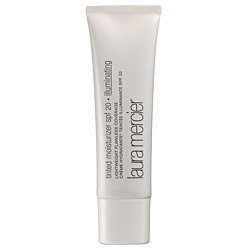 Laura Mercier has a tinted moisturizer that is the perfect combination of a moisturizer and a coverage without being too much make-up. I have been using this product for the past year and it is amazing. I throw this on in the morning before anything else to give my skin a blank canvas. I personally use "Warm Radiance" in the Illuminating type. I enjoy the highlight to the skin with the coverage. For anyone looking for that light make-up that gives you a fresh, awake, and lively look for your day, look no further. Bonus: This product also has a SPF 20 which is perfect to keep skin healthy all year long!